About a month or so ago, I decided it was time to clean up my diet. It wasn’t even that I was eating poorly, but more that Aaron and I were relying on packaged convenience foods a little too much. 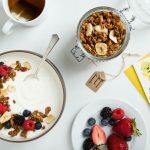 Things like pre-made veggie burgers, granola, jam, cashew yogurt, soy creamer—just a lot of everyday staples with sneaky ingredients like “natural” flavors and carrageenan that I would never add to my food if I were making it myself. Eating this way was making me feel sluggish and I knew I could do better. So, I decided to take a quick inventory of the convenience foods on our grocery list, and came up with a few really simple recipes to replace them. The creamer was a very easy swap because I already had an awesome vegan coffee creamer recipe (seriously, you’ve gotta try that one!). 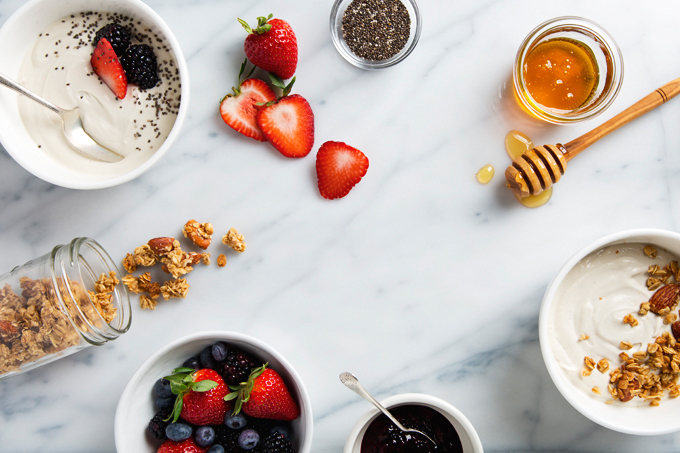 From there, I tackled our expensive, sugary non-dairy yogurt habit. Aaron is the primary yogurt-eater at our house. He has it almost every morning with his granola or muesli, and he was hooked on a brand that costs $2/serving. I knew I could edit my cashew-based creamer recipe to make a thick and rich cashew yogurt recipe that would rival our favorite store-bought brand. 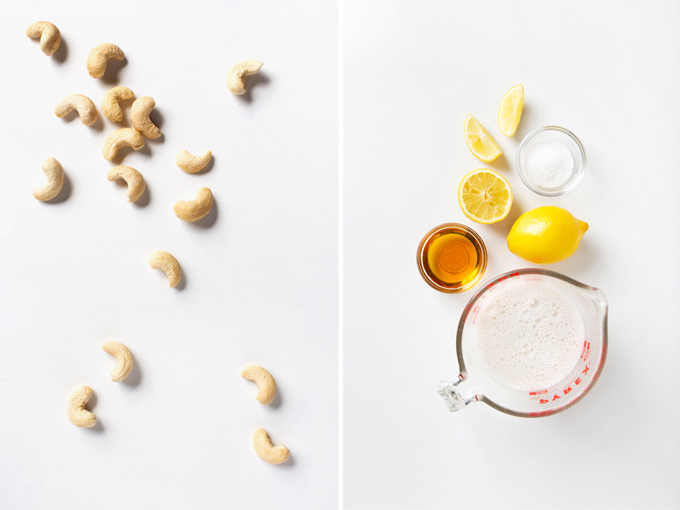 As it turns out, all you need are 5 ingredients: cashews, almond milk, lemon juice, a tiny bit of maple syrup, and a pinch of salt. Soak the cashews, add everything to your blender for about a minute, and you have the richest, creamiest, low sugar vegan yogurt. The texture and flavor remind me of cheesecake filling! a handful of fresh fruit—strawberries, sliced peach, pineapple, etc. 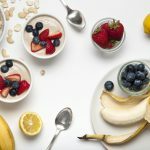 If you’re regularly buying yogurt at the grocery store each week, definitely give this cashew yogurt recipe a try! Just one pound of cashews is enough to make 2 batches of cashew yogurt and 2 batches of cashew creamer, and with the exception of needing to soak the cashews, it will take you all of 5-10 minutes total. I love it when the homemade versions of things are better tasting, better for you, and less expensive! 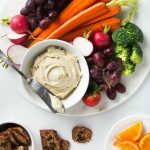 This vegan cashew yogurt recipe is extra creamy, low in sugar, and so easy! All you need are a few simple ingredients and a blender. Drain and rinse the soaked cashews. Add all of the ingredients to a high-speed blender. Process on high speed for 60 seconds, or until very smooth and creamy. Taste and adjust the sweetness. Transfer the yogurt to a jar or airtight container and store it in the fridge. It will thicken once it's chilled and should keep for about 5 days. 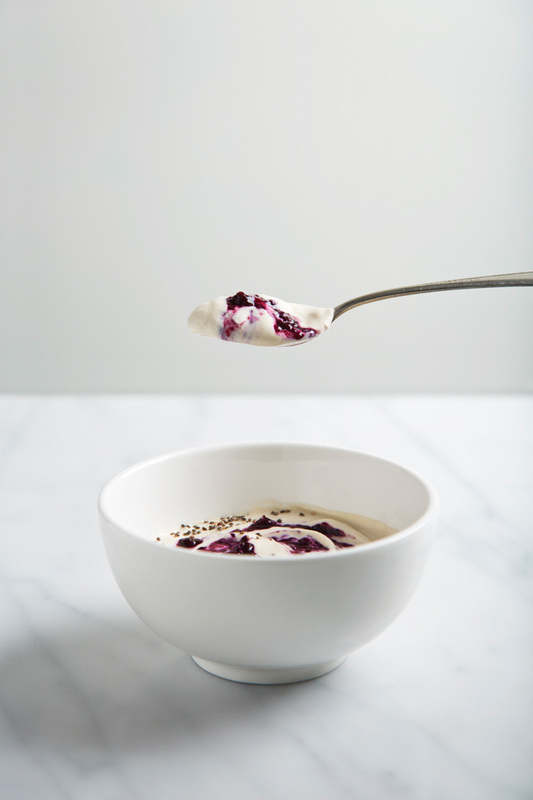 This recipe makes a thicker, whole milk style yogurt. It will be pourable immediately after blending and will thicken as it chills in the fridge. If you'd like to thin it out, simply whisk in a tablespoon of almond milk at a time to reach your desired consistency. Feel free to replace the almond milk with an equal amount of your favorite non-dairy milk. I use and recommend a Vitamix Blender. a small handful of fresh fruit—strawberries, sliced peach, pineapple, etc. Recipe inspired by this Easiest Vegan Coffee Creamer. Filed Under: Breakfast, How To Make..., Snacks COPYRIGHT © 2019 Amanda Maguire. All Rights Reserved. Yes!! This is exactly the recipe I’ve been needing. Do you think cashew pieces will work instead of whole cashews? I imagine it will – I use cashew pieces for EVERYTHING and never had a problem! GIRL it’s like you’re in my head. Totally going to soak cashews right now! great sounding recipe! the homemade version always tastes so much better. I’m curious as to what you are considering a serving? is it a full cup? also would you have any idea what the protein content and calories would be? Thanks. We usually get about 4 servings out of the recipe. It’s filling/calorie dense, so a little goes a long way. 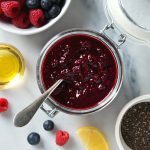 Does this sort of home made yogurt contain any beneficial bacteria/probiotics? Either way it’s going to be delicious but I’m curious if these are present. Thanks! This is totally delicious. How delicious is it? Just licking the spatula cleaning out the blender the first time I made it, it was so good I immediately started soaking more cashews to make another batch. I added a generous dollop of pure Mexican vanilla and the contents of 1 probiotic capsule. Next batch will add vanilla and blueberries to the yogurt mixture and then add sliced banana at serving time. If i add probiotics to this will it still work? This was delicious! I added blue spirulina powder to mine and served it on top of raspberry nice cream (made from frozen bananas and raspberries). Thanks for the delicious recipe! Oh, wow! That sounds like the most deliciously high-vibe treat. Hi. Is the salt required? Could another type of salt be used? Could you use raw unfiltered honey instead of maple syrup?